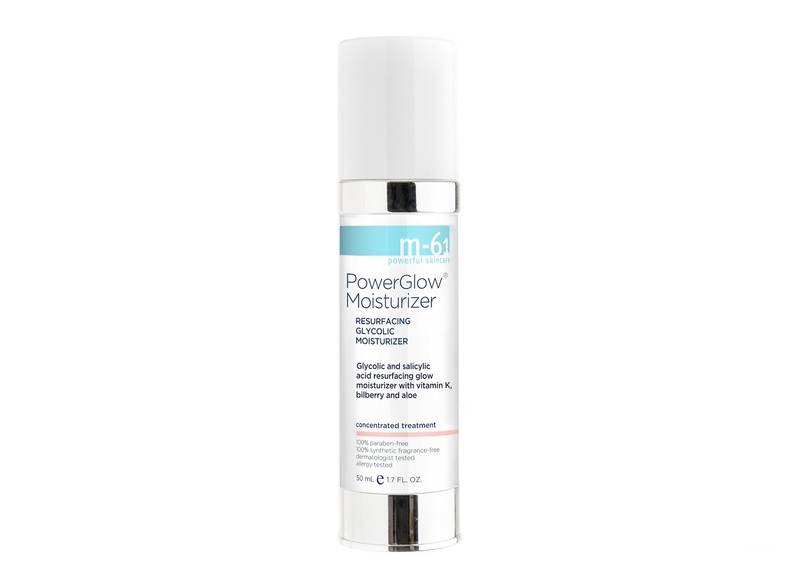 I received 4 products from m61 powerful skincare to try out. Lets say they are very powerful. I noticed a difference almost immediately with this stuff. That's due to all of the AHAs used in the products. This is a great cleanser for anyone who is in need of a new cleansing routine. It is a pore, purifying glycolic cleanser with tea tree an Vitamin B5. It is gluten-free and vegan. 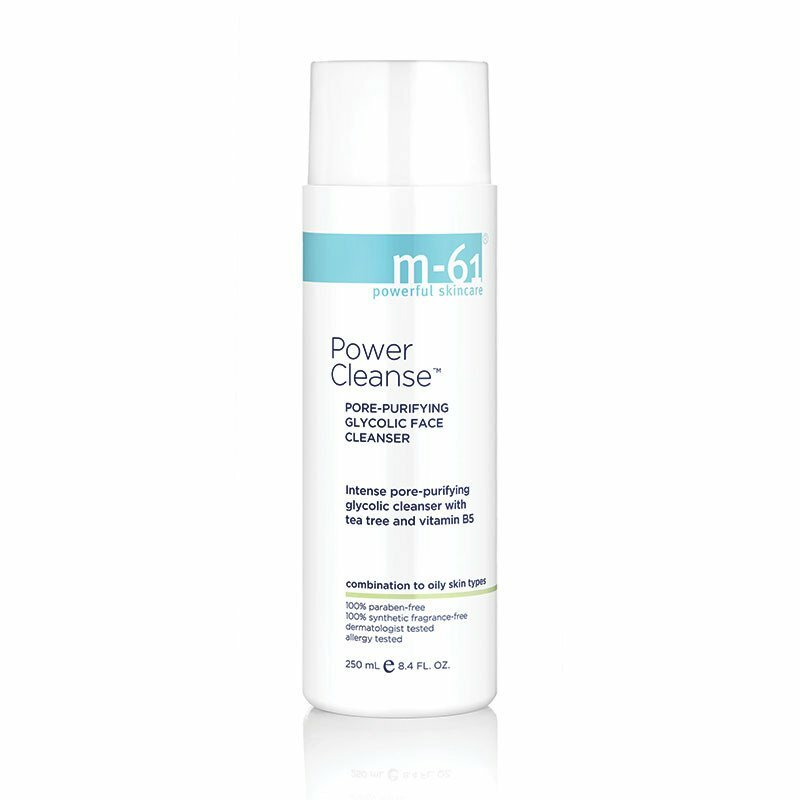 The cleanser is a sulfate-free gel cleanser formulated to wash away dirt, makeup and excess oil without stripping the moisture barrier away. Glycolic acid removes dead surface skin cells and cleanses pores (actually the hair follicles) to help remove bacteria and leave the skin feeling soft. Tea tree extract helps improve the look of blemish-prone skin. 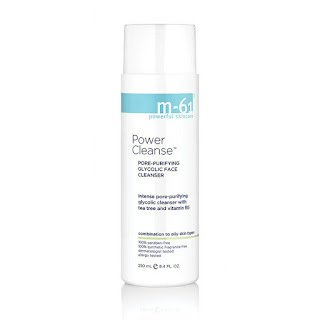 This cleanser is best used on combination and oily skins worried about breakouts. It can also be used for mature skin clients who want a deep exfoliating cleanser. These peel pads are quick glycolic and salicylic acid exfoliating peel pads with Vitamin K, billberry and chamomile. They are vegan. The Vitamin K helps to reduce the appearance of spider veins and combats dry, rosacea-like patches. Glycolic and salicylic acid help reduce pore size, reduce the appearance of fine lines and improve the skin’s tone, texture and clarity. Antioxidant bilberry extract helps promote an even skin tone, while chamomile and lavender assist in calming and soothing irritation. This is best for the kind of customer who has dull or dry skin, is worried about wrinkles or hyperpigmentation and/or is experiencing breakouts. Marla loves this pre-makeup and pre-moisturizer before a very important event for a radiant glow. She also loves it for hormone related breakouts, which she seems to get. How to use it: Apply peel (a pre-soaked towelette) to clean, dry skin. Gently move over face and neck while avoiding eye area. Do not rinse off. It is Recommended to start 3 times a week and build up to using every day. I love, just love these peel pads. I love anything with AHAs and BHAs in it. They are the most helpful anti-aging ingredients that we have available to us so we need to use them. The stronger the better as it causes injury to the skin which causes it to make collagen. elasticity and guarding the skin from environmental stressors. skin moisturization and the smoothing of fine lines and wrinkles. Aloe vera has been used topically for thousands of years to treat wounds, skin infections, burns, and numerous other dermatologic conditions. benefits to inflamed skin than hydrocortisone cream. Aloe vera is often recommended for acne scarring and wound healing, as it increases both the synthesis of collagen and the production of hyaluronic acid in skin. 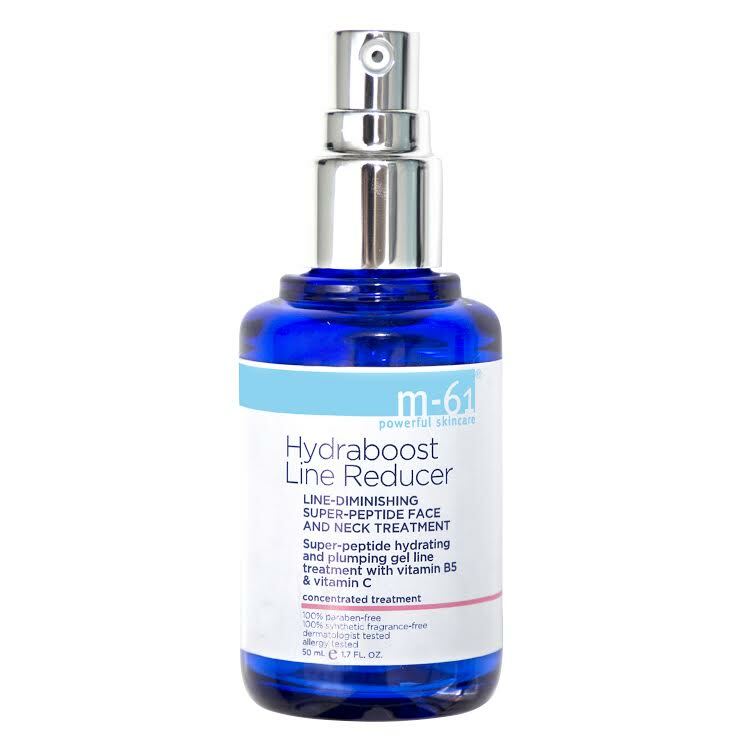 supercharged blend of seven multi-action peptides to fill in and reduce the visible appearance of deep set wrinkles and fine lines. Who Should Be Using This: For the person who is looking to plump, hydrate and fill in deep set wrinkles on the neck, jawline, upper lip, forehead and the outer corner of the eyes. How To Use: After cleansing and drying the skin, apply 2-4 pumps onto your fingertips and apply to the face and neck. If needed, follow with a moisturizer. This moisturizes so well, in the spring and summer months you may not need another moisturizer. It acts as more than a serum. It is a moisturizing primer that helps to get skin ready to accept moisture and hydration. Vitamin K helps reduce the appearance of spider veins and combats dry,rosacea-like patches. Antioxidant bilberry extract helps promote an even skin tone while chamomile, lavender, and aloe assist in calming and soothing irritation. Bilberry is a shrub found in the mountains of Europe and North America. It isrelated to the North America’s blueberry and huckleberry. reduce inflammation. Chamomile contains flavonoid and essential oils that possess significant antiinflammatoryand anti-allergy activity. Chamomile functions as an antimicrobial, antiallergic, anti-inflammatory, antioxidant, and analgesic and was approved by the German Commission E for inflammatory mucocutaneous diseases and wound and burn therapy. Aloe vera has been used topically for thousands of years to treat wounds, skin infections,burns, and numerous other dermatologic conditions. One study has shown that aloe vera gel exhibited greater anti-inflammatory benefits to inflamed skin than hydrocortisone cream. Aloe vera is often recommended for acne scarring and wound healing, as it increases both the synthesis of collagen and the production of hyaluronic acid in skin. Lavender is useful against anti-fungal infections. New studies show that lavender extract increases relaxation during cosmetic procedures. hyperpigmentation, while improving many other skin conditions, including actinic keratosis, hyperkeratosis, and seborrheic keratosis. Glycolic acid reacts with the upper layer of the epidermis, weakening the binding properties of the lipids that hold the dead skin cells together. This allows the stratum corneum to be exfoliated, exposing live skin cells. Salicylic acid is a beta-hydroxy acid. Beta hydroxy acid is able to penetrate into the pore which contains sebum and exfoliate the dead skin cells that are built up inside the pore. Vitamin K helps clear bruises and improve the appearance of skin. Reduces facial discoloration caused by poor circulation, skin irritation and scarring. Topical vitamin K is often used as a facial remedy for clearing bruises and improving the appearance of skin. The American Cancer Society reports that vitamin K creams are also used by individuals wishing to reduce facial discoloration caused by poor circulation, skin irritation and scarring. A study titled “Effects of topical vitamin K and retinol on laser-induced purpura on nonlesional skin” published in the “Journal of Dermatologic Surgery” evaluated the effectiveness of vitamin K cream. Researchers applied topical vitamin K on the faces of patients suffering from purpura or colored patches that occur on skin due to surgery. The results indicated that vitamin K cream significantly reduced facial bruising associated with laser surgery. chamomile and lavender instantly soothe skin after the glycolic and salicylic acids slough off dry skin cells. Who Should Be Using: For the person who has dull or dry skin, is worried about wrinkles or hyperpigmentation and/or is experiencing breakouts. 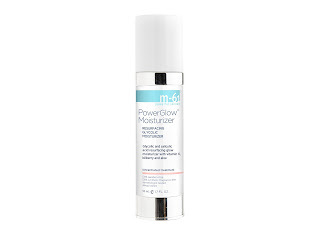 Marla loves this moisturizer on its own and under makeup for a radiant glow. She also loves it for when she’s experiencing hormone-related breakouts. USAGE Apply to clean, dry skin after cleansing and/or serum. 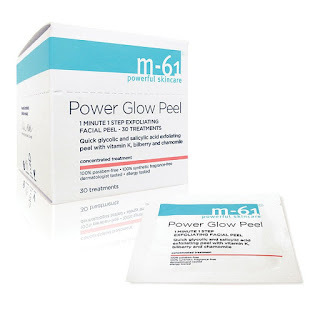 Use a PowerGlow®Peel prior to applying PowerGlow® Moisturizer for added benefits. Day and/or night. I just absolutely love this product. Great when my skin is acting oily. It works well with the peel pads. This is more for oilier skins but can be used with the Hydraboost Line Reducer. Just use that first then follow with the moisturizer. Currently all products are avaialable online at www.m61labs.com.